As you can see the first two exercises prove that the generalization of push muscles being on the front and pull muscles being on the back is not great, but for some it is helpful although not entirely accurate. You use your back muscles and your biceps to pull. With most movements more than one muscle or more than one muscle group is being used, but usually we say the exercise works which ever muscles it works the most. As with the Lat pull down, it is called a Lat pull down because the Latissimus dorsi is responsible for most of the effort, however in most cases your biceps are assisting. There are other muscles in your back that are putting in some effort too and it depends on which kind of lat pull down you are doing. Yes, there are different kind. Usually when the exercise being done is with free weights there is less muscle isolation. 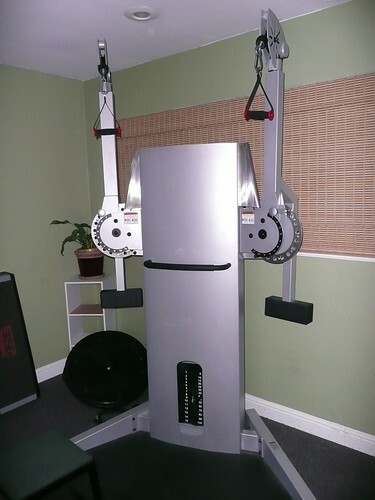 Some machines do a great job of muscle isolation. Sometimes an exercise can be considered both or neither and it is add to a workout to work a “popular muscle”. The sit ups were added because most of the time people want to work the abs. I think of the single leg squat as either a push or a pull because sometimes I really feel it in the glutes and sometimes I swear it is all quads. This is just a sample of what a “pull workout” could look like. The weight used, the reps done, the speed in which do it and how many times you do it all depends on what you are trying to accomplish. This can be done different ways. It could be done all in a row as listed or done in sets. Depends on what you want. The picture is of the Cable Cross Machine at least Freemotion calls it that. I call “the Machine”. It lives at the gym in San Jose.